In the last two decades, free markets have swept the globe. But traditional capitalism has been unable to solve problems like inequality and poverty. 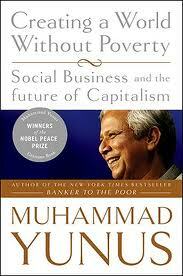 In Muhammad Yunus’ groundbreaking sequel to Banker to the Poor, he outlines the concept of social business—business where the creative vision of the entrepreneur is applied to today’s most serious problems: feeding the poor, housing the homeless, healing the sick, and protecting the planet. Creating a World Without Poverty reveals the next phase in a hopeful economic and social revolution that is already underway.